Generally Speaking 26 – Why Can’t Red Have Nice Things? For those of you who don’t know me personally, I haven’t actually been playing Magic for very long. I originally played between Revised and Alliances, catching a bit of Mirage before boxing up my cards and moving on to other things. Back then, cards were different than they are now; playing with modern cards, new frame aside, is like playing a different game because of the complexity in rules as well as the cards themselves. When I started playing again, I bought a lot of singles from the sets that I passed over to fill out my decks. Innistrad block is the first group of sets that I have extensively played with since 1997. One of the things that has changed is how each of the colours work; in the time that I did not play, each of the colours managed to get options that were previously unavailable. Card draw found its way into green and black, and different sorts of removal became the province of different colours. Except for red. Red has remained as stagnant as ever, and has not improved a whit since 1997. Back in ‘97, red played the direct damage game, and destroyed artifacts and lands. Arguably, that’s all red ever did. The creatures were not especially efficient, and the concept that red would be the ‘dragon’ colour was still in its infancy with only a handful of dragons in print. The core tenets of chaos, destruction, and short-term gain at the expense of the long-term were all in place. When I read the Red Colour Pie article by Mark Rosewater, I saw that red was perhaps the best defined colour from the beginning. Of course, it was a tad embarrassing that Disenchant had been printed alongside Shatter for all of my initial play experience, but there was Detonate, Shatterstorm and more fancy ways of destroying artifacts available to red as time went on. Shatter was at least better than Crumble, and certainly better than Phyrexian Tribute. On the land-destruction front, Sinkhole and Ice Storm were not reprinted after Unlimited. 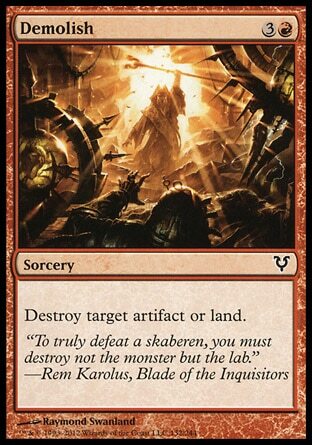 There were more targeted land destruction cards printed in Ice Age (Icequake and Thermokarst), and again in Mirage and Visions (Choking Sands and Creeping Mold), but these cards demanded some kind of colour commitment, and red generally still ran the show with Stone Rain and Pillage. Creeping Mold was especially irksome because it was the first card that could target three different card types, but you payed for it in the then-high mana cost. 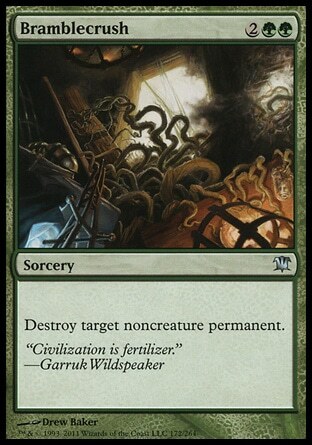 Creeping Mold was also the first pinpoint enchantment destruction green had. When I returned to Magic in 2011, I didn’t pay these things too much mind. It wasn’t until Innistrad block that I really noticed something was amiss: Bramblecrush and Demolish were both printed in Innistrad block, and I think their presence together is indicative of something seriously wrong with red’s capabilities. My question is, who decided that green destruction cards would be simply better than red ones? I understand that Creeping Mold was an extremely versatile removal spell when it was printed, but it’s contender was Pillage, which was a more red-intensive Stone Rain. There are a couple of things to consider when comparing Bramblecrush to Demolish, if you think it analogous to Creeping Mold (or other Ice Age/Mirage-era land destruction cards) and Pillage. The first issue is that Mana fixing in the modern environment is leagues ahead of what it was in ‘97. Casting Pillage usually meant you were in mono-red; the only ‘dual lands’ available were Ice Age pain lands or depletion lands. There were no fetches until Mirage, and they operated much like Evolving Wilds, where there was a delay in the land’s use. The delay on Mirage fetches and depletion lands was more of a serious issue back then; weenie decks were all the rage for a very long time, and something with a converted mana cost of four had to be a finisher, or otherwise be devastating. Partly, this is why Creeping Mold got something of a free pass; in those days, it would have certainly been a tempo loss to destroy your opponent’s offensive permanent, and it was not usually worth it because four mana was basically a late-game turn. The point of this is that Pillage and Creeping Mold were commitments back then; the double-coloured mana requirement meant a lot more and usually required a mono-colour deck if you wanted to cast it early and consistently. I say with no reservations that Bramblecrush is easier to cast – both in terms of mana fixing, and in terms of the game’s pace – in today’s Standard than Creeping Mold was in it’s respective era. Again, I ask, who decided that green destruction cards would be better than red ones? Recall the red Colour Pie article by Rosewater: one of red’s top portfolio’s is destruction. If you take a quick peek at the Green Colour Pie article, you’ll note that green’s destruction is reserved for the unnatural things (though it is unclear how all lands, including basic ones, and planeswalkers are unnatural). Now, there are some factors that I can understand that ended up making Bramblecrush better than Demolish. I can understand that the developers at Wizards do not like land destruction as a thing that could be carried out with regularity, which explains why Demolish costs four mana, and is not simply a reprint of Pillage. Second, I can see why red does not destroy enchantments; that wasn’t something that was ever in the province of red, even if the Rosewater article gives the rather flimsy excuse that “Enchantments aren’t tangible, thus red doesn’t know how to blow them up.”. I thought we were all wizards, here. But, if red doesn’t know how to blow them up, surely the actual creation of enchantments is even more baffling. Whatever, I digress. Why does Bramblecrush destroy lands and planeswalkers, and why doesn’t Demolish destroy planeswalkers (aside from the fact that it’s a reprint)? I understand if there is a desire to print a modern Creeping Mold, but there comes a point when the card is treading on the toes of other colours. Rain of Thorns is a perfect solution for advanced removal, where there is flexibility and power for a premium cost rather than cheap, versatile removal. Demolish, on the other hand, needed to be a new card rather than a reprint. If it’s going to cost four, maybe it should also have a ‘both’ mode, like Rain of Thorns. Or perhaps it should destroy planeswalkers. Perhaps it could be a cantrip. This is exactly how red has fallen behind: Demolish is a ghastly reprint meant to meet modern restrictions, but is unable to compete with new cards in the same block. I’ll understand if they don’t want to reprint Pillage, but reprinting Demolish next to Bramblecrush is nigh unforgivable. The second thing I’ve noticed is the failure for red to receive significant new mechanics, or for there to be reasonable expansion upon old ones. Innistrad block saw red get Looting, as a mechanic. Sadly, it seems like it was at the end of the line after the other colours got their fill, and red received little attention. Black saw massive expansion on its life-for-draw profile with Bloodgift Demon and Griselbrand, while white saw a ton more ‘no you may not’ rules cards, like Angel of Jubilation, Stony Silence, Nevermore and Curse of Exhaustion. And so on. These cards all fit in their respective colour pie breakdowns, like black’s general life-for-power vibe, and white’s need for order, especially in the form of ‘rules’. But red saw another draw-seven in the form of Reforge the Soul, a couple of copy effects like Increasing Vengeance, some anti-block Panic effects, and a handful of looting effects. While this might seem like a longer list, it really isn’t; there are so few cards that expanded on these themes, and so few of them were good (Malicious Intent, your malice is incompetent). While I have at least some understanding about the direction of the game and colour portfolios when comparing Bramblecrush and Demolish and can see how these may have been lost in the shuffle especially with Demolish being a reprint, there is no excuse for the debacle displayed above. Now, for you sticklers out there, it is true that Prey Upon is not strictly better than Blood Feud. It is distinctly possible that you could have two of your opponent’s creatures fight each other, and there is a possibility that they both will die as a result. But, this is unlikely; it is infrequent that the two creatures you wish to eliminate will have favourable power and toughness to create a two-for-one scenario, unless you are willing to kill two insignificant creatures, which tend to be closer in power and toughness. In fact, when spending six mana on removal, you would generally want to kill their largest creature, which Blood Feud precludes if you target two of theirs. Prey Upon requires your creature to fight one of the enemy, rather than giving the option of the rare or insignificant two-for-one. So Prey Upon is not strictly better than Blood Feud. More seriously, for all intents and purposes, Prey Upon is a decently playable card and Blood Feud won’t make the cut in a draft deck if you were unlucky enough for it to land on you as the last pick of a pack. Recall, again, the articles about the provinces of red and green. You could make vague notions about natural order, predators and prey, and creatures hunting one another to justify Prey Upon. On the other hand, the word “Fighting” literally appears in the things red cares about in Rosewater’s article. That means that “Fighting” should be red’s thing, and the mana costs of these cards should be reversed. Green could afford it anyway. Moreover, it makes sense from red’s themes and goals: the article goes on at length that red resorts to ‘physical answers’, and the path of least resistance to its desires. What could be more physical and direct than actual fighting? To make matters worse, red has historically had a near-monopoly on fighting cards. While Arena was a colourless land originally printed before I started playing, its Magus counterpart from Time Spiral block, Magus of the Arena, was red. Shortly after the Magus was printed, Morningtide saw Rivals’ Duel which should have cemented red’s relationship with the mechanic of basic brawling. Yet, Prey Upon throws all of this off the mountain. One mana to fight, in a colour known for its corpulent creatures. 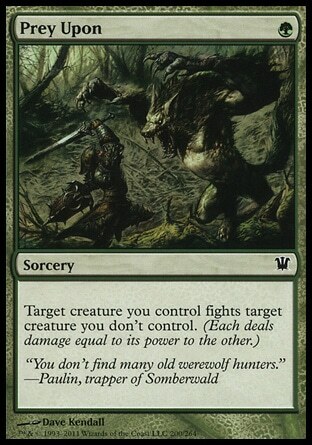 To make this worse, green also received an announcer for its fights: Ulvenwald Tracker allows you to repeatedly pit your creatures against others at instant speed for a very low cost. While fight is hardly a major mechanic, it definitely surprises me that green should get the real goodies while red should be left in the cold. Perhaps I’m bitter about Fight in particular because I have enjoyed using Arena for so long. The least they could have done is reprint Rivals’ Duel instead of printing Blood Feud; after all, there is a fair amount of thematic tribal action going on in Innistrad block with the Zombies, Vampires, Angels, Demons and Humans, and Rivals’ Duel is vaguely tribally oriented. No, instead, they reprinted Demolish in that slot. Whenever I hear a podcast or an interview, the rumour is that development at Wizards is looking at ways to give red some goodies that aren’t land destruction. The truth of the matter is, the bed they’ve made for red is pretty narrow; red gets to burn creatures and players, and destroy artifacts. Also, red destroys lands, but not too easily because land destruction apparently shouldn’t be a thing since it drives new players away. I think there needs to be more direction in the destruction angle, especially for planeswalkers. There is apparently ground being made on it in Return to Ravnica. More than anything, I think that the folks over at Wizards of the Coast need to stop throwing things like Strangleroot Geist, powerful destruction cards, and mechanics like Fight in green.